Lia Bermudez attended the Escuela de Artes Plasticas y Artes Aplicadas de Caracas (1944-1946), where she was a student of Jesús Soto and Ernesto Maragall. In 1948 she moved to Maracaibo where she enrolled at the Escuela de Artes Plásticas Julio Arraga (1948-1950). At the time her work was figurative, but she soon discovered that abstraction offered her a greater and more attractive challenge. She first dedicated herself to abstract-geometric painting, and then took up three-dimensional art. In her first individual exhibition at the Centro de Bellas Artes in Maracaibo (1957), Bermudez showed a series of lacquered wood hanging geometric structures. From this period on Bermúdez’s focused on the concrete materialization of lines and forms. Her three-dimensional work, though tentative at first was soon developed enough to be integrated into architectural projects. In the late 50s, she produced murals and sculptures that interacted with urban spaces and architecture of Maracaibo’s. Years later she contributed similar works to the cityscape of Caracas. In the early 60s, her desire to experiment and her interest for the study of different materials opened her to the influence of informalista movement. This is evident in her series Piedras Germinadas, in which enigmatic metallic forms broke through from the interior of a rock. Towards the end of the 60s, metal became her preferred medium. Iron was the main material in Relieves y Colgantes created in the 70’s, when she was actively producing works of installed in the urban milieu such the door of the Banco Central de Venezuela (1978) and the sculpture commissioned for the Plaza Baralt (1979), both in Maracaibo. 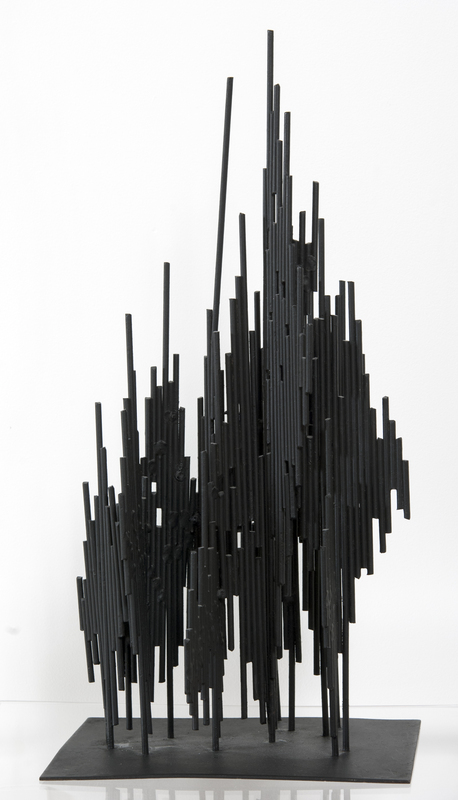 In these two monumental works, as well as in others in smaller format, Bermúdez created spacial rhythms using the carefully configured tubular structures. The organic evocation that characterized her work was accentuated during the 80s, due in part to her acute observation of nature’s structures. The forms of her work were suggested by butterflies, bats and shells, and they were characterized by movement and suspension in space. To this period belong the sculptures made for the Estación Colegio de Ingenieros of the Metro de Caracas (1982), for the Palacio de la Justicia (1987), and for Torre Corp Banca (1988), in Caracas. The decade culminated with a retrospective exhibition at the Museo de Arte Contemporáneo de Caracas (1989). New variations of Piedras Germinadas (Germinated stones), in which she used materials such as bronze, are among her most recent works. Bermúdez was awarded the Premio Nacional de Artes Plásticas in 2006.